I began watching this lovely piece of art just after Christmas. @Zero6699 bought me the first copy and right after I was hooked. Some Anime just do that to me and recently I've been watching enough that are worth the talking. 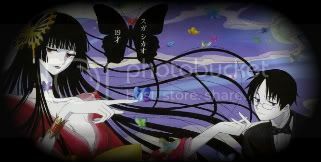 xxxHolic a very dark yet wholehearted anime. It revolves around the inevitable and that which we cannot explain, everything comes from what we wish and Yuko is more then willing to grant your wish for a price; no matter what you wish for. This anime has ghost, and protective spirits as well as things like superstitions. Truly a wonderful anime and a very good source of old believes and the world of the unexplained.